Having eaten two meals at Megumi, I strongly doubt I will bother with a third one. 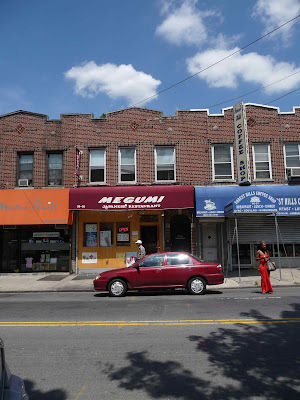 Megumi is one of a seemingly endless supply of small mediocre Japanese restaurants that have cropped up in the past few years and it doesn't stray far from the herd. It rests on the industrial, car wash end of Metropolitan between a nail salon and diner that I don't think is open anymore. I plan to eat a lot more on Metropolitan Avenue in the coming months, as people have described Metropolitan Avenue as Forest Hills' new dining district, but I think that such a statement is an exaggeration, at best. Especially between Continental and Woodhaven. Walking inside, you immediately notice the blandness of the place. No passion seems to have gone into it. Even the air conditioner, a necessity in this sweltering heat, seemed to have given up. It was very stuffy inside. Maybe that's why almost all of the lights were off and I ate in the dark (I intentionally overexposed the photo). Maybe that's why I was the only one eating here instead of having take out. 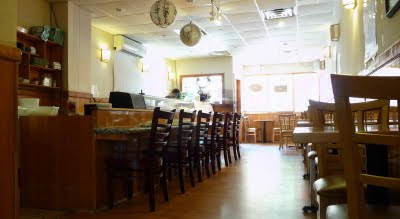 The Miso Soup, a mainstay of any Japanese restaurant, was pretty good, but it was all broth. Not one cube of tofu, not one scallion, accompanied the few, lonely shards of seaweed, floating at the bottom as though hiding from my cheap plastic spoon. 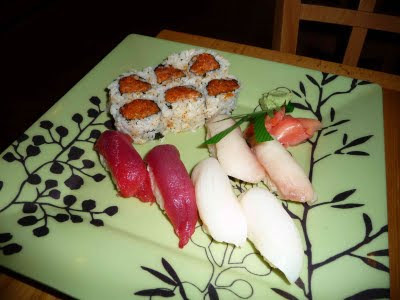 The Sushi meal, which consisted of a Spicy Tuna Roll and six pieces of sushi was actually warm. The fish itself was good if not varied, but someone needs to invest in a bag of ice. 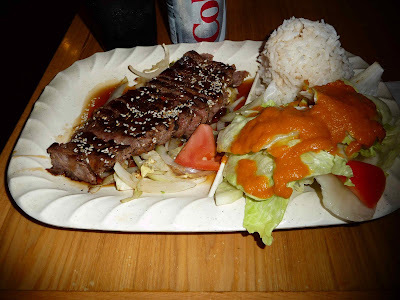 I also tried the Beef Teriyake, which came with a salad and sat on a bed of barely cooked onion. I can't say anything much about this except that I wouldn't order it. It was boring and tasteless and the salad, admittedly never the most impressive part of any Japanese meal, appeared to have more dressing than lettuce. Each dish was pretty cheap at under $10. I feel like there could be room for improvement if they cranked up the AC, turned on the lights, took the cheap paper signs down from the window and put more energy into their chow. Oh... and I got a fortune cookie?? ?